(Bloomberg) -- Israel’s Blue & White bloc, the main challenger to Prime Minister Benjamin Netanyahu in April 9 elections, wants to use the country’s natural gas riches to alleviate the developed world’s worst traffic congestion. 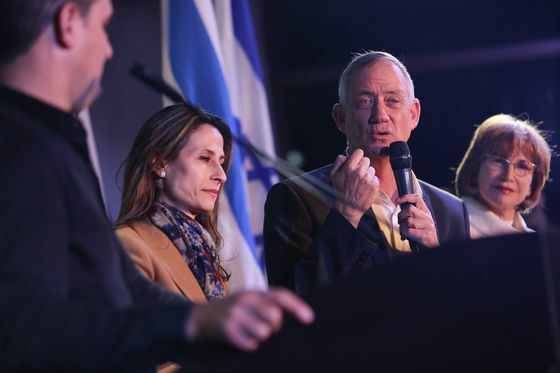 Led by former military chief Benny Gantz, Blue & White is looking at potentially taking bigger sums than currently allowed from Israel’s nascent sovereign wealth fund to invest in badly needed infrastructure projects. The bloc could tweak the law to boost disposable cash from the fund, whose main purpose is to invest royalties from Israel’s natural gas industry abroad, said Orit Farkash-Hacohen, a candidate on the Blue & White ticket who’s advising the bloc on its economic agenda. With one of the lowest passenger rates for train travel and nearly double the concentration of cars on the road than the next closest country in the Organization for Economic Cooperation and Development, Israel has “by far the highest” road-traffic density among developed nations, according to an International Monetary Fund report. That kind of congestion could cost the economy about 25 billion shekels ($7 billion) a year by 2030, according to Israel’s state comptroller. Economic policy has played only a small role in the election campaign, where polls show Blue & White locked in a close race with Netanyahu’s Likud party. Gantz and his running mates have criticized Netanyahu for letting Israel’s roads deteriorate into gridlock. The Bank of Israel, along with many economists, has called to urgently upgrade transportation infrastructure. The comptroller’s report blamed the Transportation Ministry, led since 2009 by the Likud’s Israel Katz, for the shortcomings. Netanyahu’s government has invested 30 billion shekels in public transport over the past decade, campaign spokesman Eli Hazan said. The Prime Minister’s Office has compiled a list of nearly 200 billion shekels worth of infrastructure projects, such as a light rail network for Tel Aviv and improvements to Jerusalem’s rail system, scheduled for the next three years. The central bank will begin deploying assets from the sovereign wealth fund, known as “The Fund for Israel’s Citizens,” once it receives its first 1 billion shekels next year. Farkash-Hacohen said one possibility is to change the law, which caps at 3.5 percent the amount the government can divert from global investments during the fund’s first nine years. The fund is expected to grow to more than 100 billion shekels by 2040 as the government take from major contracts involving Israel’s largest natural gas reservoir ramps up, according to Farkash-Hacohen. She was ousted as chairman of the Electricity Authority after clashing with Netanyahu over the framework to develop Israel’s gas fields. Israel set up its sovereign wealth fund in 2014 to neutralize expected demand for the shekel once gas companies began executing their deals, which could drive up the currency and hurt exporters.